Document Exploitation: Destruction of U.S. Rendition Flight Manifests at Diego Garcia? Destruction of U.S. Rendition Flight Manifests at Diego Garcia? Jason Lewis, investigations editor for the Sunday Telegraph, recently had a piece on his Not 4 Attribution blog called "UK admits it does hold records on secret 'Rendition' base." Lewis posts a June 2012 letter from Henry Bellingham from the U.K. Foreign Office informing Andrew Tyrie of the House of Commons that an answer Bellingham gave in response to a January 2012 Parliamentary question regarding records kept by the U.K. of U.S. flights landing in Diego Garcia in March 2004 was inaccurate. The UK does not hold any flight manifest information on flights which landed in Diego Garcia in March 2004. British Indian Ocean Territory immigration authorities hold immigration cards for civilians arriving in Diego Garcia during that period. But based on "further enquiries," Bellingham states that there is actually "information in three other sets of documents held in Diego Garcia by the [British Indian Ocean Territory] Administration" including "General Declarations made by arriving flights" that include "details of owner/operator, marks of registration and nationality; flight number; date; departed from; crew number and sometimes names; sometimes the number of passengers but never names." Lewis notes this is "the second time Ministers have had to admit they misled Parliament over Britain's role in rendition" (on the earlier occurrence see this Wikileaks cable that purports to be a U.S. State Department cable from 2008). The additional U.K. records on Diego Garcia are interesting enough, but what particularly intrigues me is another part of Bellingham's letter in which he states that his "further enquiries," which clearly included a consultation with the U.S. government, "have confirmed that flight manifests are only held by the US air transport provider, Air Mobility Command (AMC) - and then only for a period of three years" (emphasis mine). The Air Mobility Command is part of the U.S. Air Force and therefore the three year period would appear to refer to a retention period for flight manifests in an Air Force records schedule (many of which are available from the National Archives here - I have not yet attempted to pinpoint the relevant schedule or item). Assuming it's accurate, the 3-year retention period for the AMC flight manifests -- no doubt cited to Bellingham by U.S. officials -- illustrates quite well one of the central shortcomings of records control schedules. In particular, they very often fail to capture the distinction between an unremarkable record like a normal, routine flight manifest, which has limited value and for which a 3-year retention period might be appropriate, and an extraordinary record like a flight manifest documenting a flight that, without the apparent knowledge of the government on whose territory the flight was landing, carried individuals seized in foreign operations who were accused or suspected of terrorism and that were being rendered to Qaddafi's Libya, which has exponentially more value, both legal and historical. The language in the letter gives the impression that the 3-year period has been consistently and mechanically applied to all of them. There is, however, an argument that the standard retention period should have been overridden for the rendition flight manifests on the grounds of foreseeable litigation or relevant investigations. 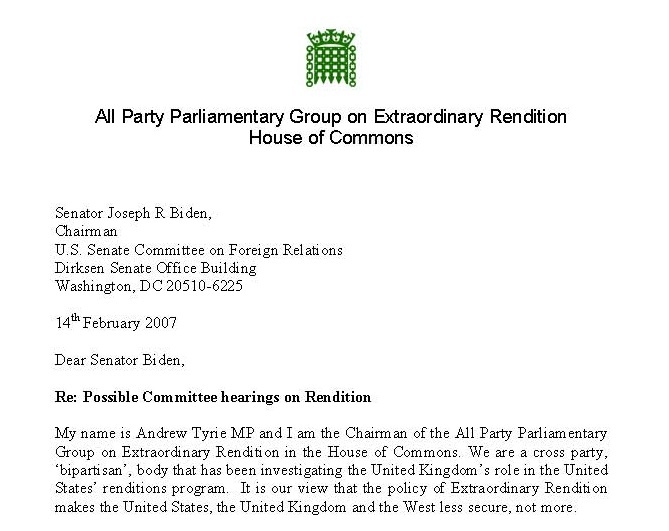 As just one example, in February 2007 -- that is, prior to the expiration of the purported 3-year retention period on the March 2004 rendition flight manifest -- the same Andrew Tyrie to whom Bellingham's recent letter was addressed wrote this letter on behalf of the House of Commons to then Chairman of the Senate Foreign Relations Committee and current Vice President of the United States, Joseph Biden asking him to investigate whether, among other things, "the United States conducted any rendition flights through the United Kingdom for which the United Kingdom did not give permission, or of which the United Kingdom had no knowledge?" Not long afterward the Senate Foreign Relations Committee held this hearing. Of course, this is not the first time the integrity of military airport logs have been the subject of considerable controversy.